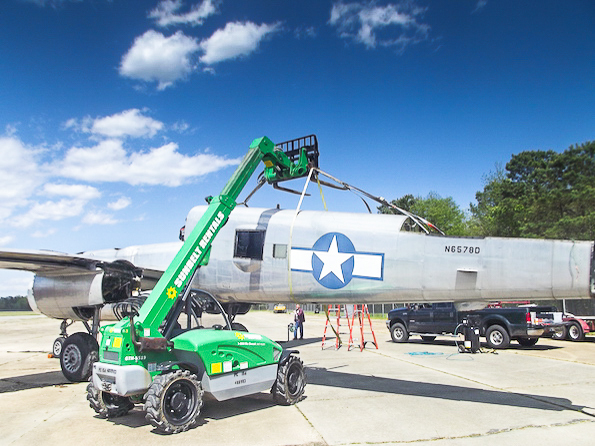 Long neglected B-25 Mitchell leaving Franklin, Virginia for Australia. – Douglas B-26 Invader, 44-35898, currently undergoing assessment in Queensland with a view to acting on its immediate future in the next six weeks. This could be either repair in situ or transport by road to a repair facility in southern Australia. Click HERE to see WarbirdsNews report on this aircraft. – B-17 Flying Fortress – While this is presently a collection of parts and drawings, a shipment of B-17 components is currently being readied for shipment to Australia and following this, larger sections will be recovered and consolidated into this long term project. – Republic P-43 Lancer – There are no complete Lancers known to exist, but Reevers has enough material to form the basis of a rebuild. While this project is in its early phases, as time permits and the allocation of resources improves, this particular aircraft will be developed into a static rebuild. Other projects currently parked for future work include Curtiss P-40 Kittyhawk A-29-99 and Supermarine Spitfires BS219 and BS234. Of course the future will certainly bring trades and possible changes in Reevers priorities, but this will be dependent upon operational demands i.e. keeping aircraft flying or in good display condition. With limited wrecks and virtually nothing in Australia to work from, Peter admits, “I finally reached a point when I figured I would have to get one probably from a Pacific nation, and probably one in very poor condition. 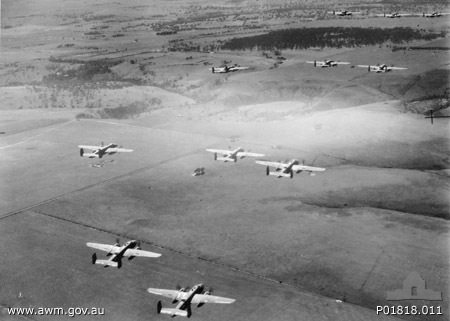 I began enquiries and had some positive feedback.” Peter says he would, “generally engage a local museum or council member to supply photos or to have people I know inspect the aircraft.” With feedback coming in, it became obvious that the B-25 wrecks still available are, as Smythe expressed, “in my opinion, past it”. With his local and Pacific options now crossed off the potential survivor locations list, Peter Smythe turned to the USA. Peter says in his search for a potential airframe, “I knew of the Franklin B-25 and a few others sitting around the globe, and made efforts to contact the respective owners – not a lot of luck there.” Then out of the blue in late 2014, he received an e-mail saying that Lucky Lady was listed on the online auction site e-bay. Peter Smythe decided to follow this opportunity, but due to poor timing and other priorities he couldn’t place a bid… “So I lost that opportunity, but then came another email to me, telling me that the new owner only wanted a few parts to put towards a project they already had, and the remaining aircraft shell would be sold.” With this new window of opportunity now open to finally acquire a B-25 Mitchell, Peter said, “I recommended that Reevers made the necessary inquiries, confirm the status of the aircraft, and purchase it.” Reevers clearly felt that the B-26 Invader they already owned would make a great display side-by-side the Mitchell. Lucky Lady’s history to date has been mixed. Peter says, “her life from WWII to the mid-1960s indicates she had a few private owners and then in 1967 she was converted into a camera ship for film use, which saw her used in the Battle of Britain movie in 1967-1968 in Europe. She then wasn’t used until new buyers bought her in late 1970s. 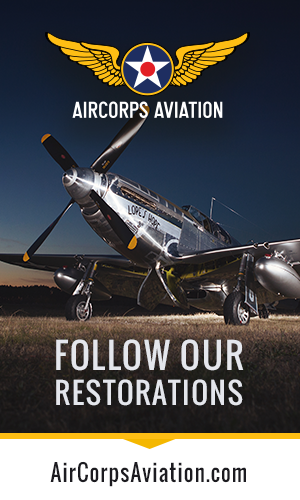 She was restored to flying status and from the early 1980s to 1999 was flying as a warbird, but again withdrawn from use in 1999 at Franklin, Virginia.” Since 1999, the aircraft has remained, minus an engine and mostly neglected to the elements, in Franklin, Virginia. After the sale and transfer of the aircraft to Reevers concluded in early 2015, Reevers began to organise its move to South Australia. Reevers decided to offer the Mitchell’s tear-down to a museum local to Franklin so their members could gain skills and the museum some extra capital. So from late April to early May 2015, Lucky Lady’s disassembly took place and she is now being prepared for shipment to her new home in Australia. 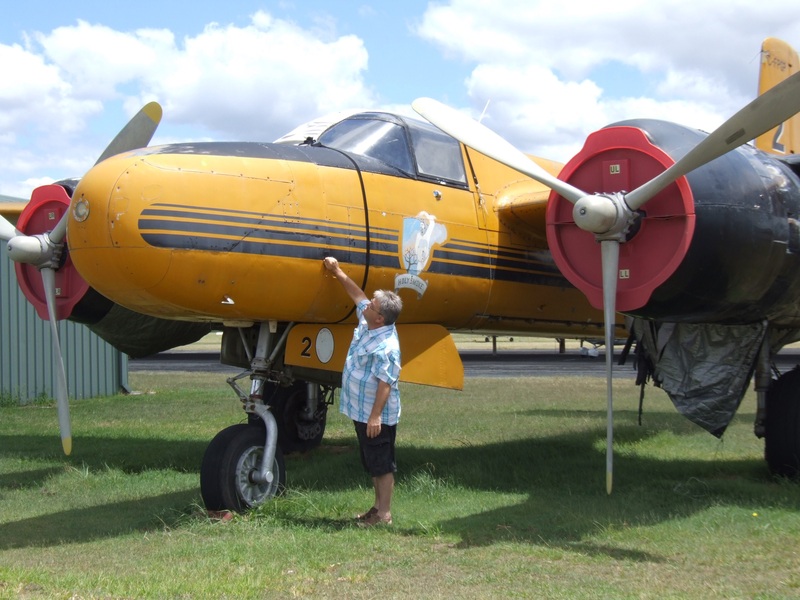 The tear-down team did a superb job, but it became apparent during the work that the aircraft will need some major repairs once in Australia to slow down some serious corrosion problems the aircraft now suffers from. Once in Australia, a complete inspection will take place to identify the missing parts, such as turrets, engine and internal fittings. Paperwork for the aircraft’s export to Australia has been submitted, with the Australian authorities giving the green light for the import. Once the US authorities have signed off on the export, the Mitchell will be crated for the next available shipment to Australia. 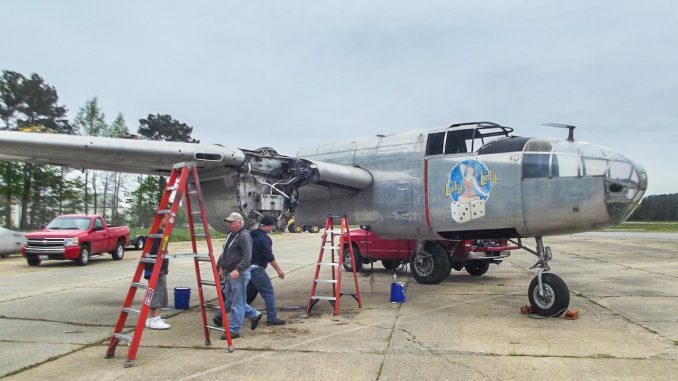 WarbirdsNews will follow Lady Luck’s travels and report on further progress during her rebuild as she moves towards long term preservation. WarbirdsNews wishes to thank Phil Buckley for his report, and especially to Peter Smythe and Reevers for both saving an important aircraft, and providing us with photographs of her recovery. We wish them much luck in the future. Reevers has a presence of Facebook HERE. Their website is still in its infancy, but can be found HERE. For more photographs of the dismantling process see the gallery below. It’s clear that this will be a mammoth restoration process, but it’s great news to see this aircraft being saved for the future. Interesting note about a possible build of a P 43 Lancer. The last Lancer was scrapped in Indiana approx. 1958. Earl Reinert had the QEC ,and landing gear plus ammunition boxes from it. He had them at his home in Arlington Heights ,Illinois. Not sure what happened to the P 43 parts after he passed away in 1992. Would this rebuild have them? can you drop me an email on peter@reevers.com.au? When I was stationed in Norfolk, VA, the helicopter squadron I flew with used Franklin often as a practice field. I remember looking out the windows at the sad sight that this B-25 (and a PT-19 that sat near it) were in. 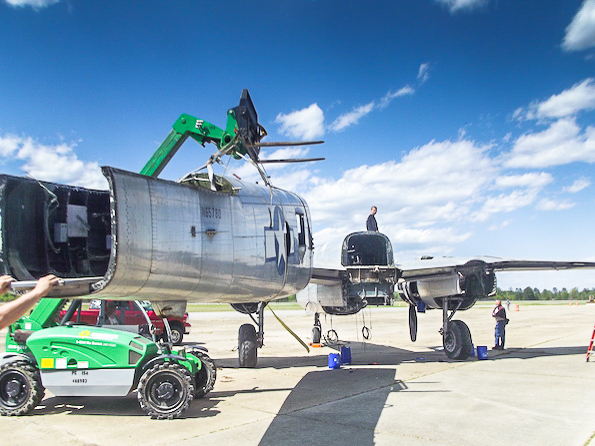 I’m glad to hear that the B-25 is in good hands, but sad to hear it’s no longer in the US. I have the full history of this B-25 since I was one of the four owners that did the restoration once this aircraft came back to the US from England. This B25 won the “Best bomber” award for restoration at Oshkosh. Can’t believe it came to this! Will ex Pyschedelic Monster N65780 “Lucky lady” fly again? My father delivered 8 B-25 to the Congo in 1969. King Leopold and Air America. Any idea where they are at. Got pics of planes on tarmac. Was wondering where our airports mascot went to. I had been trying to find out for so long weather they finally decided to get her a hanger or just moved her from line of sight. God to know she finally got a home and hope she can once again spread her wings. I saw the story on Channel 7 News Adelaide tonight (8/4/17) and was fascinated. I have been to the Battle of Britain Memorial Flight in England where they have a Lancaster Bomber among other things. But the thing I suddenly remembered was that I have a book, ‘Battle of Britain’ by Leonard Mosley (1969) that has a coloured photo of the ‘Lucky Lady’ decked out in her ‘Psychedelic Monster’ outfit. The book also has information on how they used her for filming. You probably have this anyway but I thought I would mention it. There was a B-25 flying in Australia in the 1970s – appeared at some air shows before eventually going back to USA. It was on the Australian civil register and locally owned at the time. It was non-flying and somewhat derelict last I knew.